This homely B & B is spaciously built in double-story house in Hlanze Village, over looking the majestic Lubombo Mountains. 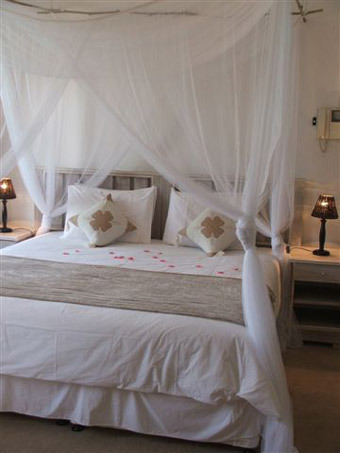 With a total of 10 Rooms the Villa has a quaint, welcoming feel about it. Our “Executive Family Room” has a King Size Bed with Air Conditioner, and its own private TV with DSTV available. En-suite family room with 2-x ¾ beds are attached to the main room, and a beautiful en-suite King Size Bath service this luxury room. A Double-bed bedroom with private bathroom and a Twin Room with 2-x ¾ beds are also situated down stairs with Air-conditioning. Upstairs has 7 privately situated En-suite bedrooms, each with air conditioner and fans. As we pride ourselves with cleanliness each room has it’s own set of 100% percale bedding for each bed. 4 Twin rooms each with 2-x ¾ beds are very comfortable for sharing guests. These rooms can become a “Super King Bed” with extra large linen, for that Royal Feeling. A standard King Size bedroom has it’s own patio and view from above. Also upstairs is a standard double bedroom with en-suite shower and a single en-suite room with one ¾ bed.